2018 Carl E. Lee Broadcast Engineering Excellence Award honoree Tom Bosscher, Chief Engineer at WSCG-FM (left), and MAB Chairman Peter Tanz, Senior Vice President, Midwest Communications (right). 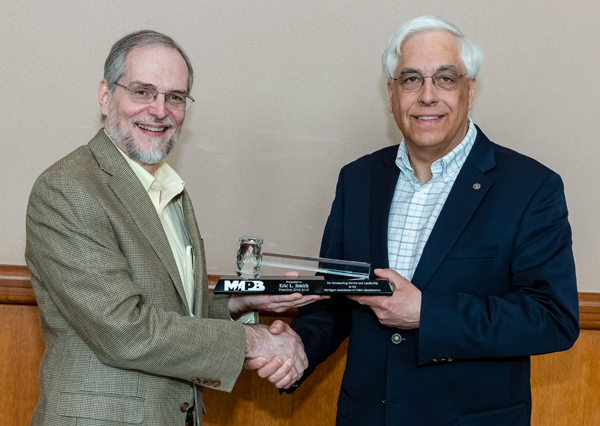 The Michigan Association of Broadcasters (MAB) presented its most prestigious engineering award during the Great Lakes Media Show on March 7 at the Lansing Center. 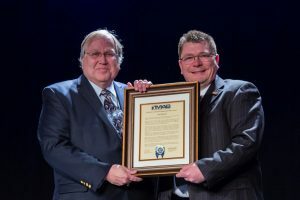 The 2108 Carl E. Lee Broadcast Engineering Excellence Award was presented to Tom Bosscher, Chief Engineer at WSCG-FM (Grand Rapids Christian Radio). Tom Bosscher started his career in broadcasting at an early age. He received his first amateur radio license when he was in grade school, and took the test to obtain his FCC Radiotelephone 1st class license on a dare while still in high school. Tom started his official broadcast career at WION-AM in Ionia and found himself at the WOOD-AM/FM stations in Grand Rapids at the age of 18. He later went on to WLAV-AM/FM in Grand Rapids and installed a Pirod 400-foot tower, FM antenna and transmitter for the Class B upgrade. In June 1995, he went to work for WCSG-FM. Among his first projects was the installation of a 25kw Continental transmitter and FM DA antenna and installing the first of many Broadcast Electronics AudioVault systems. Tom has helped WCSG expand to four on-air stations. Tom is credited for designing the Grand Rapids Area Information Line (GRAIL), a “one phone call” school closing system that served the Grand Rapids local schools for 12 years. He also developed a significant mobile remote setup using three receiver sites, three vehicular repeaters, two communication grade repeaters and ran 300 to 400 remotes a year for newly built studios for the Federated Media Grand Rapids stations, WCUZ and WCUZ-FM. 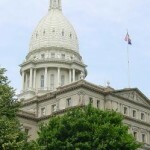 According to a report in Gongwer, 25 current and former legislators and legislative staffers subpoenaed by plaintiffs challenging Michigan’s maps for the U.S. House, Michigan Senate and Michigan House have filed a motion last week to quash those subpoenas. The motion was filed at the U.S. District Court in Detroit, which is hearing the case, the motion argues the subpoena violates legislative privilege that protects legislative communications, are overly broad, request information unrelated to the plaintiffs’ claims and impose an undue burden on nonparty legislators, former legislators and current and former legislative staff. 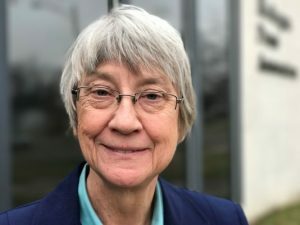 Democratic voters have filed suit against the 2011 reapportionment plan passed that year by the Legislature as an unconstitutional partisan gerrymander. According to a report in Broadcasting & Cable, the FCC will release an additional appropriation of repack funding over the next four to six weeks. The move comes after the FCC announced it has received verified and unverified post-auction repack expenses totaling $1.95 billion. The move was praised by the National Association of Broadcasters. “We intend to work with policymakers to ensure that broadcasters are quickly and fairly compensated for these expenses. Our overriding goal is a successful repack that protects viewers and is completed as expeditiously as possible,” said NAB’s Dennis Wharton. The FCC signaled that there would be multiple allocations to cover expenses related to moving to new channels after the auction. The agency also signaled that the $1.75 billion would not be enough. 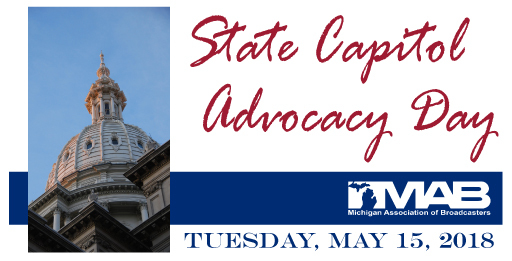 State Capitol Advocacy Day on May 15. MAB members are invited to meet with their local lawmakers and leaders who chair committees of influence to the broadcast industry. Why Attend State Capitol Day? The purpose of this event is to showcase television and radio stations’ commitment to their local communities and the investment it takes to make that happen. This includes community service, local programming content and the broadcast industry’s economic impact and job creation. With term limits in place, it is important that we maintain strong relationships with our legislators so that the MAB can most effectively represent your interests. What is the best way to do that? By having constituents visit lawmakers and explain why these issues are important to them. We work to oppose any proposal for state ad tax or tax on services. MAB works to open up public notice revenue to our members by reforming the outdated public notice laws. MAB helped pass legislation to standardize FOIA costs across the state. MAB battles to keep the sales tax deduction on broadcasting equipment. MAB works to ensure your station is not burdened by state regulations on the use of drones in newsgathering. Christman Building, 208 N. Capitol Ave.
Christman Building 208 N. Capitol Ave. Please NOTE: Appointments will be scheduled for you with each of your legislators. Our lobbyist, Rob Elhenicky of Kelley-Cawthorne and MAB’s Government Relations Director Elena Palombo will hold a briefing to update you on the state legislative issues. You will receive talking points and meeting materials two weeks prior to the event. You will also have a chance to meet with the legislators and staff during the legislative luncheon at the Capitol. Newly elected MAPB Board of Directors President Gary Reid (left), Director Emeritus for Michigan State University Public Broadcasting, and immediate past-president Eric Smith (right), Director of Broadcasting, Northern Michigan University. The Michigan Association of Public Broadcasters (MAPB) elected its 2018-2019 Officers of the Board of Directors during a board meeting held on Tuesday, March 6 in conjunction with the Great Lakes Media Show at the Lansing Center. For more information about MAPB and the board members visit MichMAB.com/MAPB. On February 27 and 28, MAB members traveled to Washington, D.C. for the 2018 National Association of Broadcasters State Leadership Conference and MAB Call on Congress. Michigan broadcasters met with the Michigan Congressional delegation and their telecommunication staff to discuss: (1) the need to ensure that the repacking timeline and relocation funds are adequate as not to disrupt TV and radio broadcast service; (2) ensuring the ability of broadcasters and pay –TV operators to continue conducting private, market-driven negotiations for retransmission consent; (3) broadcasters’ opposition to the performance tax and MAB’s support of the Local Radio Freedom Act; and (4) broadcasters’ opposition to the Microsoft request for free spectrum to operate unlicensed devices.